Clontz Returns to Corvallis as Skipper of Falcons. 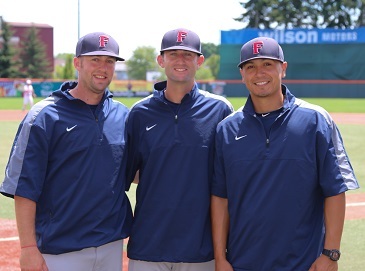 A year of managing in Australia, four years as an assistant in the West Coast League and another as an assistant at Ohlone College in Fremont, Calif., helped prepare Billy Clontz (pictured with fellow Kelowna coaches and ex-Knights' Dylan Jones and Richie Jimenez) for his initial summer as a West Coast League head coach. "It's all going well," Clontz said before last Friday's series opener with the Knights, a 9-3 loss for the Falcons in which he was ejected for arguing a close call at second base. "We've taken some lumps early, but I like the personalities and work ethic on our team. "We're just trying to instill a winning culture right now," in a program that hasn't made the playoffs since 2007. "This road trip has been huge to get everybody out of their host families houses, into the hotels and just get on the road and grind. "Anytime you get to come home, it's great. I spent seven years in this stadium wearing the cardinal and rocking the Knights' uniform. The guys were excited to play at this stadium and compete against the defending champs." The Falcons went 3-3 on their 6-game swing, winning 2 of 3 in Walla Walla and dropping 2 of 3 in Corvallis. Kelowna took the series finale 5-2 after losing the first two games by a combined 21-4 score, so overall it was a fun and exciting experience for the former Corvallis High School/Richey's Market American Legion standout, who subsequently played at Mt. Hood CC and at Western Oregon between summer stints with the Knights. He was a starter at several infield and outfield positions for the Knights in 2006, 2008 and 2009. He earned all-WCL honors for Knights' teams that defeated Wenatchee in the 2008 WCL Championship Series, and that lost to the AppleSox in the 2009 finals. Following his college career, Clontz joined a Knights' coaching staff that directed the club to the 2010 West Division regular-season title, and to the 2011 and 2013 WCL championships. He also played and coached for the Morley Eagles in Australia in 2011-12. "It's been basically what I expected. I was a head coach for a year in Australia," so he hasn't been overwhelmed with the increased responsibility. "Getting to know personalities and the way they need to be taught has been interesting for me so far. "When you get 35 guys from different places, the one thing you can instill is the culture, the competitive drive, the focus and the work ethic. When you do that, guys go back to their colleges as better players. "We're pushing guys to get better, polishing their crafts, and competing along the way. If you do that, you're going to have a competitive roster. Kelowna hired Clontz on Oct. 7, 2013, and he immediately went to work building a coaching staff. He struck paydirt by adding former Knights' MVPs Richie Jimenez and Dylan Jones, his teammates on a 2009 Corvallis club that lost to Wenatchee in the WCL Championship Series and set a league record for wins. "I'm blessed to have a couple assistants I played with a lot," Clontz said. "We all think very similarly. When you can bounce stuff off guys who know how you think, and you know how they think, it makes it a lot easier. "I have bought into the process. There's been some lumps early but we are fighting to get out of it. I'm impressed with the way our guys have competed." Clontz is one of three WCL head coaches with Knights connections. Corvallis skipper Brooke Knight played for the Knights in the early nineties; Medford coach Josh Hogan was an all-WCL middle infielder for the Knights from 2007-09 and helped them to three WCL Championship Series appearances and the 2008 championship.